Fires, fires have been the theme this summer. 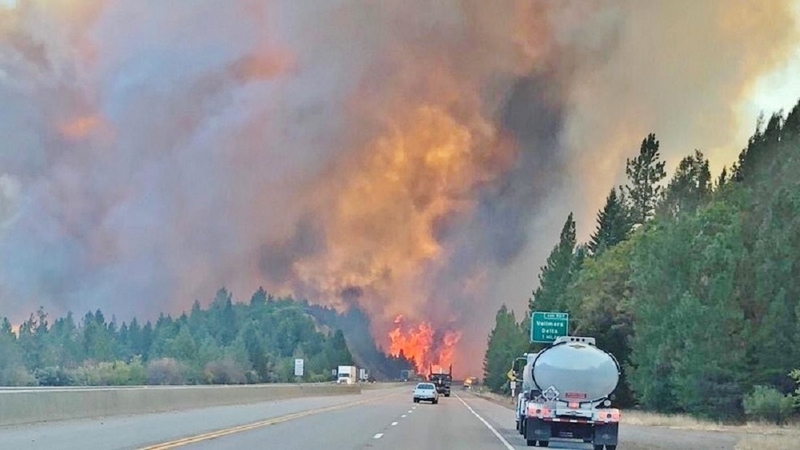 First the Carr Fire that devastated Redding, then the Hirz Fire that threatened the McCloud River and now the Delta Fire which engulfed the lower section of the Upper Sacramento River and I-5. My trip to the North Umqua and Montana was cut short by the alarming threat of the Delta Fire as it spread rapidly along I-5 in an area that hadn’t seen a fire for over a 100 years. Fortunately the first two are out and the Delta Fire is now at 98% containment. We are finally seeing smoke free days but on the down side the fires have had a toll on the forest. With winter approaching we can only hope that the McCloud and Upper Sac River watersheds don’t suffer too bad …. time will tell. For the moment though conditions look good for an excellent Fall season season here. The McCloud River is having a very good showing of Browns. With the cooling nights and days Fall is the wake up alarm that triggers these brutes into an active mode in preparation for their spawning later in November/December. The Rainbows are waking up also and have received the getty up memo as the water temps drop and the bugs start showing. Expect the hatches to ramp up soon, not seeing any October Caddis yet but any time they will start migrating off the bottom and moving towards the bank. Nymphing and streamers have been the ticket for success, fish deep for nymphs, the clarity is about 3-4 ft. and put a heavy sink tip on for those deep pools. Most productive bugs have been LBS and a variety of streamers. Big bushy dries can work too, seeing a lot of looks along with an occasional suicidal grab. The Upper Sac is fishing very good too up around Dunsmuir and down to mid river. The further south you go on the river the more likely to find bigger fish. Access below Gibson has been tough due to the fire mop up but when it opens up I expect the fishing to be very good. Haven’t seen any October Caddis yet but that should happen any day. Nymphing has been most productive by far, best results have been LBS, rubber legs and soft hackles. Wild Waters guides recently did a recon to the Lower Klamath to checkout the steelhead run. To their pleasant surprise the lower river showed a very strong steelhead presence with numerous pods of them moving through. We experienced some double digit days with a mix of half pounders and adults. I don’t want to get too cocky but hang on to your knickers, this may be one of those good years after a couple of mediocre ones. Up on the Rogue we have been experiencing some very good days too, there are steelhead spread throughout the system. Most of our efforts have been from TouVelle Park up river where there seems to be good number of summer and fall run fish. Give us a shout at Wild Waters Fly Fishing to get in on some the many choices for Fall fishing in and around the area. If you have any further questions please call the shop and when you are in the area stop in and bug Bob.